The Dáil’s youngest TD has been made junior finance minister while Labour has promoted three backbenchers. Simon Harris is the new junior finance minister, replacing Brian Hayes. JUNIOR MINISTERS ARE learning of their fate this morning as the reshuffle of the government’s Ministers of State gets under way. 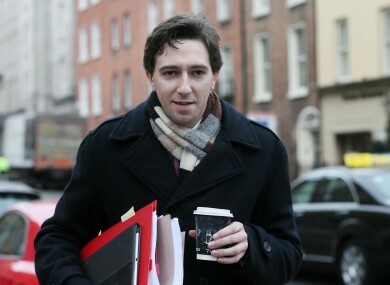 Fine Gael’s Simon Harris, the youngest TD in the Dáil, has been made junior finance minister in a surprise move. Labour has promoted backbench TDs Ann Phelan (rural affairs), Kevin Humphreys (social protection), and Aodhan Ó Riordain (justice). Junior minister Seán Sherlock is retained and will be a junior minister at the Department of Foreign Affairs with responsibilities for North-South, Trade and Overseas Aid. Kathleen Lynch is to remain a junior health minister. That completes Labour’s junior ministerial ranks when super junior jobs minister Ged Nash is included. Elsewhere on the Fine Gael side, Waterford deputy Paudie Coffey is to be made a junior environment minister while Cork North-Central TD Dara Murphy is to be European Affairs Minister. Meath West TD Damien English (education) and Donegal North-East’s Joe McHugh (Gaeltacht) have also been promoted. Comhghairdeas to all newly appointed Junior Ministers. Look forward to working with Simon, Dara, Damien, Joe and Paudie. Junior agriculture minister Tom Hayes is being retained as is junior defence minister Paul Kehoe (who is also the government chief whip) and Sports Minister Michael Ring. Former cabinet minister Jimmy Deenihan is the new Minister of State for the Diaspora as the Taoiseach confirmed last week in his senior ministerial reshuffle. Labour’s Joe Costello, a junior minister at the Department of Foreign Affairs, has been told he is being dropped this morning with others set to learn of their fate in the coming hours. Fine Gael TD Ciaran Cannon has been told that he is no longer required as Minister of State for Training and Skills at the Department of Education. Minister of State for NewERA and Fine Gael TD for Louth, Fergus O’Dowd, has been dropped. It’s also expected that Small Business Minister John Perry will be axed along with Gaeltacht Minister Dinny McGinley – both are Fine Gael TDs. The Cabinet must sign off on the appointment of new Ministers of State and this is expected to happen when senior ministers meet at 12.30pm for their weekly discussion. But already this morning calls are being made to those being kept, those being dropped and those being promoted. Earlier, on his way into Government Buildings, Taoiseach Enda Kenny has said that it is “not an easy day” as he prepared to make the calls. Joe Costello tells #todaysor that Joan Burton has an "invidious position" to make the decisions she has about the reshuffle. The senior coalition partner is likely to retain control of the two of the most prestigious junior ministries – Minister of State at the Department of Finance (vacated by newly-elected MEP Brian Hayes) and Minister of State for European Affairs (vacated by new Transport Minister Paschal Donohoe). Email “The junior minister reshuffle is happening right now, here's what we know so far... ”. Feedback on “The junior minister reshuffle is happening right now, here's what we know so far... ”.